Add to My Favorite Store. OMAX 10X-20X-30X-60X Cordless Binocular Stereo Student Microscope with Dual LED Lights and Cleaning Pack. This is a cordless stereo binocular LED microscope with viewing head. It can be used on 110V power supplies as well as running with 3 AA batteries, which means that it can be used in the outdoor fields. The microscope has 10X, 20X, 30X and 60X four step magnifications with dual LED lights from both top and bottom sides. It has large working distance of 57mm and maximum field of view of 10mm. This stereo microscope is a good choice for people who like to collect coins, stamps, rocks, gemstones but with low budget. It is also a good choice for students who would like to inspect insects, botanical specimens and etc. There are many accessories such as USB cameras, darkfield stages, tweezer clips, which can be attached to the microscope to make it more powerful. The package also contains a cleaning pack, which consists of a 100 sheet lens cleaning paper booklet, and a 3 piece cleaning kit. 45°inclined binocular head with locked-in eyepieces. Dual (upper and lower) LED cold illuminators. Running on power outlet or 3 AA batteries. Adjustable focus knob tension and adjustable interpupillary distance. Total magnification: 10X, 20X, 30X, 60X. Eyepieces: widefield WF10X/20 and WF20X. Head: 45°Inclined binocular with locked-in eyepieces. Diopter adjustment on left ocular-tube. Interpupillary distance: 2-3/16" 2-15/16"(55mm 75mm). LED cold illuminators: incident (upper) and transmitted (lower). Frosted glass stage plate: 3-3/4 (95mm) in diameter. White/black plastic stage plate: 3-3/4 (95mm) in diameter. Head vertical moving range (along the pillar): 2-3/4 (70mm). Focusing adjustment range: 1-5/8 (42mm). Power supply: Power adapter: 120V AC Battery: 3 AA batteries. Cleaning Pack: - 100 4"x6" cotton lens cleaning sheets - Brush length: 5-1/2" (13.5cm) - 100ml of cleaning solution - Cleaning cloth size: 5-7/8" x 6-3/4 (15 x 17cm). Dimension: 8-1/4"x 4-3/4" x 14-1/4 (21cm x 12cm x 36cm). Net weight: 5 lb 0.5 oz (2.28 kg). Binocular stereo microscope with a pair of WF10X/20 eyepieces. A pair of WF20X eyepieces. Frosted glass stage plate (D95mm). Black/white plastic stage plate (D95mm). Wrench for focus knob tension adjustment. Allen key for stage lock (1.3mm). Cleaning Pack - One booklet of 100 lens cleaning sheets - One cleaning cloth - One bottle of non-aerosol cleaning solvent - One brush. A: We are happy to leave feedback for our customers once we have been paid and the item has been delivered to the carrier. We are here to exceed your expectations! 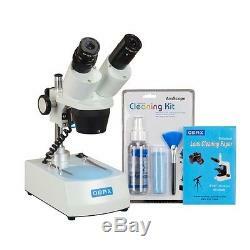 The item "OMAX 10X-20X-30X-60X Binocular Stereo Microscope Dual LED Lights+Cleaning Pack" is in sale since Friday, April 10, 2015. This item is in the category "Toys & Hobbies\Educational\Science & Nature\Insects & Bug Habitats". The seller is "bh542" and is located in Northeast. This item can be shipped to United States, Canada, United Kingdom, China, Mexico, Germany, Japan, France, Australia, Russian federation, Denmark, Romania, Slovakia, Bulgaria, Czech republic, Finland, Hungary, Latvia, Lithuania, Malta, Estonia, Greece, Portugal, Cyprus, Slovenia, Sweden, South Korea, Indonesia, Taiwan, South africa, Thailand, Belgium, Hong Kong, Ireland, Netherlands, Poland, Spain, Italy, Austria, Israel, New Zealand, Philippines, Singapore, Switzerland, Norway, Saudi arabia, Ukraine, United arab emirates, Qatar, Kuwait, Bahrain, Croatia, Malaysia, Chile, Colombia, Costa rica, Panama, Trinidad and tobago, Guatemala, Honduras, Jamaica, Antigua and barbuda, Aruba, Belize, Dominica, Grenada, Saint kitts and nevis, Saint lucia, Montserrat, Turks and caicos islands, Barbados, Bangladesh, Bermuda, Brunei darussalam, Bolivia, Ecuador, Egypt, French guiana, Guernsey, Gibraltar, Guadeloupe, Iceland, Jersey, Jordan, Cambodia, Cayman islands, Liechtenstein, Sri lanka, Luxembourg, Monaco, Macao, Martinique, Maldives, Nicaragua, Oman, Peru, Pakistan, Paraguay, Reunion, Dominican republic, El salvador.